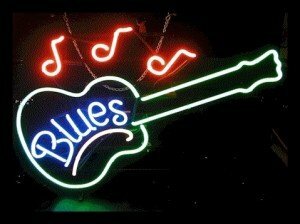 Blues music is really defined by playing the genre/style on guitar and the acoustic guitar is well used throughout the movement. Rory Galagher was a great performer of acoustic blues guitar and below is a article and video about the great Irish musician. Rory Galagher was born 2nd March 1948 and was an Irish blues-rock multi-instrumentalist, songwriter, and bandleader. 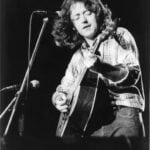 Born in Ballyshannon, County Donegal, and raised in Cork, Gallagher recorded solo albums throughout the 1970s and 1980s, after forming the band Taste during the late 1960s. He was a talented guitarist known for his charismatic performances on the acoustic guitar and dedication to his craft. Gallagher’s albums have sold in excess of 30 million copies worldwide. His father Daniel was employed by the Irish Electricity Supply Board, who were constructing a hydro-electric power plant on the Erne River above the town. The family moved, first toDerry City, where his younger brother Dónal was born in 1949, and then Monica and the two boys moved to Cork, where the brothers were raised. Rory attended North Monastery School. Daniel Gallagher had played the accordion and sang with the Tir Chonaill Ceile Band whilst in Donegal; their mother Monica was a singer and acted with the Abbey Players in Ballyshannon. The Theatre in Ballyshannon where Monica once acted is now called the Rory Gallagher Theatre. Gallagher was initially attracted to skiffle after hearing Lonnie Donegan on the radio. Donegan frequently covered blues and folk performers from the United States on the acoustic guitar. He relied entirely on radio programs and television. Occasionally, the BBC would play some blues numbers, and he slowly found some song books for guitar, where he found the names of the actual composers of blues pieces. Influences he discovered, and cited as he progressed, included Woody Guthrie, Big Bill Broonzy, and Lead Belly. Initially, Gallagher struck out after just an acoustic guitar sound. Singing and later using a brace for his harmonica, Gallagher taught himself to play slide guitar. Further, throughout the next few years of his musical development he also liked to play a lot of acoustic blues guitar. Gallagher began learning to play alto saxophone, bass, mandolin, banjo, and the coral sitar with varying degrees of proficiency. By his mid-teens, he began experimenting heavily with different blues styles. 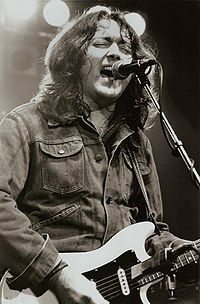 After the break-up of Taste, Gallagher toured under his own name, hiring former Deep Joy bass player Gerry McAvoy to play on Gallagher’s self-titled debut album, Rory Gallagher. It was the beginning of a twenty-year musical relationship between Gallagher and McAvoy; the other band member was drummer Wilgar Campbell. The 1970s were Gallagher’s most prolific period. He produced ten albums in that decade, including two live albums, Live in Europe and Irish Tour ’74. November 1971 saw the release of the album Deuce. In the same year he was voted Melody Maker‘s International Top Musician of the Year, ahead of Eric Clapton. He inspired many acoustic guitar beginners. However, despite a number of his albums from this period reaching the UK Albums Chart, Gallagher did not attain major star status.